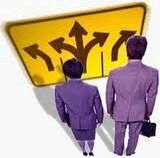 Strategic Planning - Which Way to Go? Look, most strategic planning processes are hopelessly broken. They typically produce a 1-3 year financial projection (goals/outcomes), rather than actionable items. These plans become “shelf-ware” very quickly. Quick, concise, actionable – strategic planning is the foundation to establishing business direction …. and the appropriate operations and technology – enabling the business to drive to their future and succeed in their goals. Strategic planning does not have to be hard, nor does it have to be time consuming. But the quality of the strategic planning effort is essential to effective business – and for all the functional organizations to be able to effectively work together to enable that business. Strategies are “whats”, not “how”, each with an associated set of goal/metrics, and some functional area “whats” to go with. Then it is up to each of the functional areas, to produce their “how”, supporting the defined metrics. Not much happens today in competitive business that is not enhanced by computers. The more effective the information technology environment is, the more effective the business can become. We bring extensive experience in the IT strategy and management arena as well. Linking IT and the business together up front in the early strategic planning processes is the holy grail; the elusive thing called business-IT alignment will exist by default. It is not, however, a monolithic approach to a solitary goal, but a structured and variable delivery through the enterprise architecture process, built upon the foundation of solid strategic planning goals.